(Pi-na-ple) Traditional Cake Made with Vanilla Sponge, Topped with Pineapple Pulp & Fresh Pineapple. The vanilla sponge cake is very fluffy and just the right amount of moist to eat. 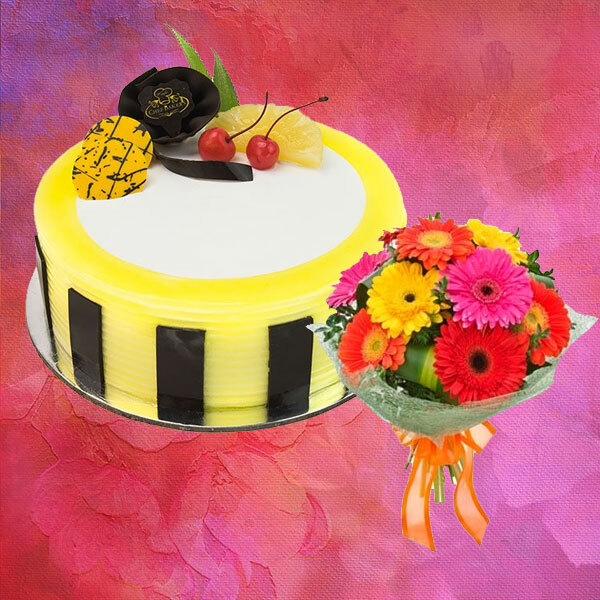 This, when topped with pineapple pulp with its juice dripping to the side gives a beautiful decorative vibe to it, ideal for any happy occasion. Moreover, to add to the pulp with be the freshly cut pineapple pieces which will very well complement it and the crunchiness of the pieces will give the cake a different taste. Combining the cakes sweetness to that of the fruit and their completely different textures and consistency will certainly leave the person eating it in awe, craving for more. Bouquet of 8 Mix Color Gerberas with Tissue Wrapping Product Consist : 8 Mix Color Gerberas with green fillers in Tissue Wrapping with Ribbon Bow on it. Black Forest Half Kg Cak..
Black Forest One Kg Cake..
Red Berry Gateaux One Kg..
Chocolate Cream Half Kg ..
Chocolate Cream One Kg C..